Flows 20 Gallons Per Minute! These kits replace the OEM timing belt driven water pump with an idler pulley and block off plate. Allows you to run the factory timing belt without water pump drag. The pumping is performed by a remote pump spliced into the lower radiator hose. A bracket is supplied to mount the pump to the transaxle. Installation of the idler plate is identical to shop manual instructions for water pump replacement. Mezieres idler assemblies are used as a block off for the factory mechanical water pump and to maintain timing belt tension. 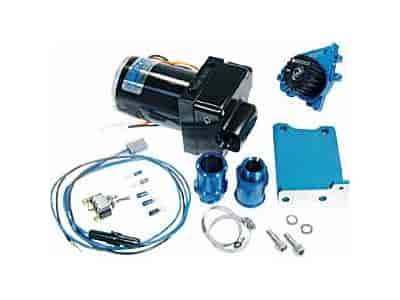 This pump kit was designed for sport compacts, small engine applications and water to air intercoolers. It is well suited for alcohol fueled drag cars. Note: The supplied bracket is designed for applications with manual transmissions. No bracket available for automatic transmission. Is there a -16 AN adapter that I can use instead of the standard clamp style fitting?